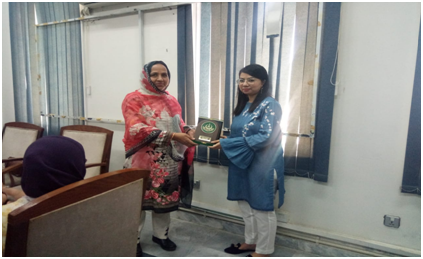 A Seminar on “Higher Education Textbook Commissioning Programme” was arranged by the office of Research, Innovation and commercialization on Friday, the 12th October, 2018. Director ORIC extended a very warm welcome to the distinguished guests and audience. She deliberated over the advantages of holding seminars on such significant subject matters. Ms. Sunehra Mehmood, Higher Education Editor from Oxford University Press Pakistan was the resource person. She highlighted the opportunities for local educators to participate in writing, adapting, reviewing, and publishing textbooks. She also shed light on the requirements to author books for OUPP and the standard of quality expected along with the technicalities of publication. She also explained the process of project conception, publishing agreement and the benefits and remuneration to the prospective authors. Employees from different faculties and servicing departments participated in this seminar.